As many as 1.71 crore people in 19 districts of Bihar were still affected by the floods, officials said. New Delhi: As many as 42 deaths in flood-related incidents were reported from Bihar in the last 24 hours, taking the total to 482, whereas five persons lost their lives in Uttar Pradesh, pushing the flood toll in that state to 101. A total of 187 blocks and 2,371 panchayats were affected by the flood, a state Disaster Management department release said, adding that the number of relief camps had come down to 222, where 1.44 lakh people had taken shelter. Araria district alone accounted for 95 deaths, followed by Sitamarhi (46), Purnea (44), Katihar (40), West Champaran (36), East Champaran (32), Darbhanga (30), Madhubani (28), Madhepura (25), Kishanganj (24), Gopalganj (20), Supual (16), Saran (13), Muzaffarpur (9), Saharsa (8), Khagaria (8), Sheohar (6) and Samastipur (2). The flood waters, however, had receded at some places, prompting many to return home, officials said. A total of 28 National Disaster Response Force (NDRF) teams comprising 1,152 personnel with 118 boats, 16 teams of the State Disaster Response Force (SDRF) and 630 Army personnel, divided into seven teams, were taking part in the rescue-and relief operations, they added. The MeT office has forecast heavy rain at one or two places of West Champaran district, north-central, north-east and south-east parts of the state tomorrow. 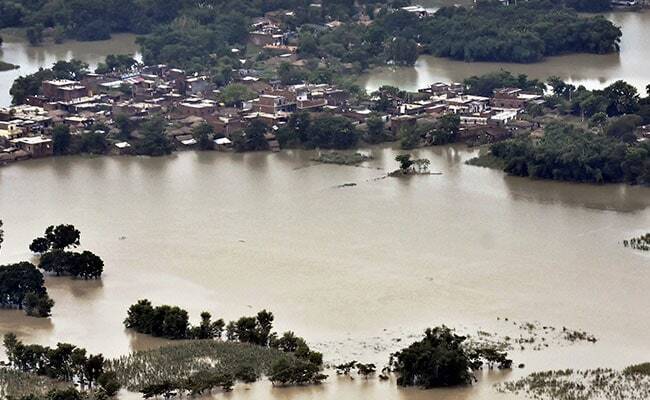 Five deaths in flood-related incidents were reported from Uttar Pradesh in the last 24 hours, taking the toll to 101, the flood control room at the relief commissioner's office told news agency PTI. Four deaths were reported from Gorakhpur district, while the other one was reported from Lakhimpur Kheri, it added. The number of flood-hit districts had reduced from 24 to 14, officials said, adding that 3,128 villages remained affected by the deluge and 2,061 of them were marooned. Rivers such as the Rapti, Ghaghara, Burhi Rapti, Rohini and Quano were in spate and had inundated vast areas of Lakhimpur Kheri, Barabanki, Faizabad and Ballia, Gorakhpur, Siddharthnagar, officials said.